The global Geoscience Technology division of BHP Petroleum needed an integrated geological and geophysical viewer for data access and collaboration over networks. 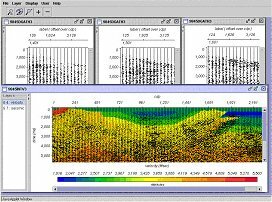 Its current reservoir simulation package did not provide seismic visualization functionality, and BHP wanted a flexible cross-section viewer that would enable its engineers to visualize and analyze reservoir simulation output, along with the associated seismic and log data. After reviewing existing software packages on the market and discussing their needs with various software application vendors, BHP decided to contract INT to develop the Viewer according to its own specifications. BHP wanted to combine its expertise in high-speed random access of large multidimensional data with INT’s java based graphics components and experience in multi-tier client-server systems, the goal being a unique data viewing application that could combine geological model data and seismic data in a single view. An important requirement was the ability to leverage INT’s Java technology to develop a viewer that would be cross-platform, easily accessible through BHP’s intranet, and deployable with no client-side administration. BHP estimates that by using the Java environment and INT’s J/GeoToolkit, the total cost for developing the Viewer is 1/5th of what such a project would have normally required. The tool has been designed to meet BHP requirements. The Viewer was designed as a framework that can be easily extended to become a front-end for 3rd party value software. The Viewer also integrates with Seismic Unix, an OpenSource seismic processing system, which BHP uses for its internal seismic processing needs. BHP has major oil exploration centers in Melbourne, Houston, and London. The viewers are installed and served through BHP Intranet. Processors can now analyze data and collaborate remotely through the company’s internal web sites, and complex views of the data can be saved and restored through a browser interface. BHP Billiton is a global leader in oil and gas exploration and production, with major producing assets in Australia, the United Kingdom, and the Gulf of Mexico.